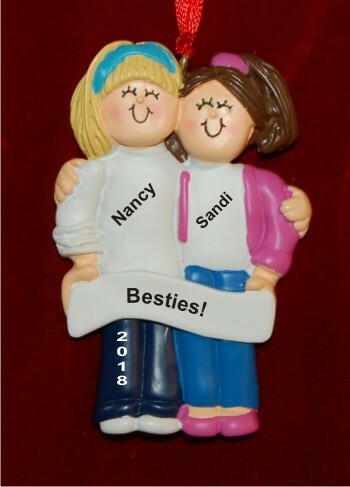 New Winter 2018: Surprise your BFF or your daughter and her favorite pal with a friendship ornament personalized for the two of them. The besties forever, blond & brunette girls ornament personalized from Russell Rhodes is an adorable way to commemorate a special bond. As a personalized girls ornament, it includes the custom details you provide, but they are hand-painted onto the ornament in a stylish font to create friends ornaments that are one of a kind. Affordable enough to have one personalized for each, the blonde and brunette girls friend ornament ships with our classic velvet gift pouch and is available in other hair colors too. Christmas gift Dec 21, 2017 Lori R.